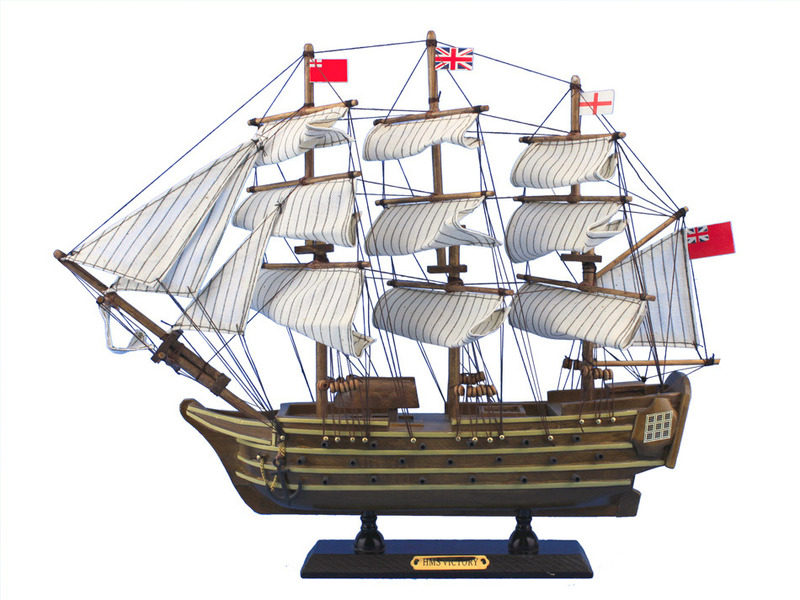 Wooden Sovereign of the Seas Masterpiece 100"
USS Constitution Limited Tall Model Ship 38"
Inspired by the HMS Victory, the most famous fighting tall ship of the British Royal Navy and oldest commissioned warship in the world, these adorable tall ships models of Admiral Nelson’s flagship rest easily upon any shelf or desk. 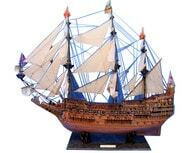 This tall model ship adds a touch of nautical history to any room’s décor. HMS Victory is a 104-gun ship of the line of the Royal Navy, built between 1759 and 1765. She is the oldest naval ship still in commission. She sits in dry dock in Portsmouth as a museum ship. In December 1758, the commissioner of Chatham Dockyard was instructed to prepare a dry dock for the construction of a new 106-gun first-rate ship. This was an unusual occurrence at the time; during the whole of the 18th century only ten were constructed—the Royal Navy preferred smaller and more manoeuvrable ships and it was unusual for more than two to be in commission simultaneously. The outline plans arrived in June 1759 and were based on HMS Royal George which had been launched at Woolwich Dockyard in 1756. The Naval Architect to design the ship was Sir Thomas Slade who, at the time, was the appointed Surveyor of the Navy. The keel was laid on July 23, 1759 in the Old Single Dock (since renamed No. 2 Dock and now Victory Dock), and the name was finally chosen in October 1760. It was to commemorate the Annus Mirabilis or Year of Victories, of 1759. In that year of the Seven Years' War, land victories had been won at Quebec, Minden and naval battles had been won at Lagos and Quiberon Bay. There were some doubts whether this was a suitable name since the previous first-rate Victory had been lost with all on board in 1744. Once the frame had been constructed it was normal to cover the ship up and leave it for several months to season. However, the end of the Seven Years' War meant that she remained in this condition for nearly three years, which helped her subsequent longevity. Work restarted in autumn 1763 and she was finally launched on May 7, 1765 having cost £63,176 and 3 shillings (present day £50 million) and used around 6000 trees, 90% of which were oak and the remainder elm, pine and fir. Because there was no immediate use for her she was placed in ordinary—in reserve having been roofed over, demasted and placed under general maintenance—moored in the River Medway for 13 years until France joined the American War of Independence. In March 1778 John Lindsay was appointed her very first captain, but he was transferred to captain HMS Prince George in May 1778 when Admiral the Honorable Augustus Keppel decided to raise his flag in Victory. She was commissioned in May 1778 under the command of Rear Admiral John Campbell (1st Captain) and Captain Jonathan Faulknor (2nd Captain), with the flag of Admiral Keppel. She was armed with smooth bore, cast iron cannon 30 × 32 and 42 pounders (15 and 19 kg), 30 × 24 pounders (11 kg), and 40 × 12 pounders (5 kg). Later she also carried two carronade guns, firing 68 lb (31 kg) round shot. Keppel put to sea from Spithead on July 9, 1778, with a force of thirty ships of the line and, on July 23, sighted a French fleet of twenty-nine ships 100 miles (160 km) west of Ushant. The French Admiral, Louis Guillouet, comte d'Orvilliers, who had orders to avoid battle, was cut off from Brest but retained the weather gage. Two of his ships escaped into port leaving him with twenty-seven. The two fleets manoeuvred during shifting winds and a heavy rain squall until a battle became inevitable with the British more or less in column and the French in some confusion. However, the French managed to pass along the British line with their most advanced ships. At about a quarter to twelve Victory opened fire on the Bretagne of 110 guns, which was being followed by the Ville de Paris of 90 guns. The British van escaped with little loss but Sir Hugh Palliser's rear division suffered considerably. Keppel made the signal to follow the French but Palliser did not conform and the action was not resumed. Keppel was court martialled and cleared and Palliser criticised by an inquiry before the affair turned into a party political squabble. On December 2, 1781, Victory, now commanded by Captain Henry Cromwell and bearing the flag of Rear Admiral Richard Kempenfelt, sailed with eleven other ships of the line, a 50-gun fourth-rate, and five frigates, to intercept a French convoy that sailed from Brest on December 10. Ignorant of the fact that the convoy was protected by twenty-one ships of the line under the command of Luc Urbain de Bouexic, comte de Guichen, Kempenfelt ordered a chase when they were sighted on December 12 and began the Second Battle of Ushant. When he noted the French superiority he contented himself with capturing fifteen sail of the convoy. The French were dispersed in a gale and forced to return home. In 1796 Captain Robert Calder (First Captain) and Captain George Grey (Second Captain) commanded Victory under Admiral Sir John Jervis's flag. Sir John Jervis sailed from the Tagus on January 18, 1797, and after being reinforced on February 6 by five ships from England, his fleet consisted of fifteen sail of the line and six frigates. On February 14, the Portuguese frigate Carlotta, commanded by a Scotsman named Campbell with a Portuguese commission, brought news that a Spanish fleet was close. Jervis manoeuvred to intercept, and the Battle of Cape St Vincent was joined. Principe de Asturias, leading the Spanish leeward division, tried to break through the British line ahead or astern of Victory but that ship poured such a tremendous fire into her, followed by several raking broadsides, that the whole Spanish division wore round and bore up. Horatio Nelson, in HMS Captain (primarily), also played a decisive role in this action. In February 1798, Victory was stationed at Chatham under the command of Lieutenant J. Rickman. On December 8, unfit for service as a warship, she was ordered to be converted to a hospital ship to hold wounded French and Spanish prisoners of war. In 1799, Rickman was relieved by Lieutenant J. Busbridge. However on October 8, 1799 HMS Impregnable was lost off Chichester, having run aground on her way back to Portsmouth after escorting a convoy to Lisbon. She could not be refloated and so was stripped and dismantled. Consequently, now short of a first rate, the Admiralty decided to recondition Victory. Work started in 1800 but as it proceeded an increasing number of defects were found and the repairs developed into a very extensive reconstruction. The original estimate was £23,500 but the final cost was £70,933. Extra gun ports were added, taking her from 100 guns to 104, and her magazine lined with copper. Her figurehead was replaced along with her masts and the paint scheme changed from red to the black and yellow seen today. Her gun ports were originally yellow to match the hull but later repainted black, giving a pattern later called the "Nelson chequer" and which was subsequently adopted by all Royal Navy ships after the Battle of Trafalgar. The work was completed on April 11, 1803 and the ship left for Portsmouth on May 14 under her new captain, Samuel Sutton. Lord Nelson hoisted his flag in Victory on May 16, 1803 with Samuel Sutton as his flag captain and sailed to assume command in the Mediterranean on May 20. Nelson transferred to the faster frigate Amphion on May 23. On May 28 Captain Sutton captured the French Embuscade of 32 guns, bound for Rochefort from San Domingo. Victory rejoined Lord Nelson off Toulon on July 30 when Captain Sutton exchanged commands with the captain of the Amphion, Thomas Masterman Hardy. Victory was passing the island of Toro on April 4, 1805, when HMS Phoebe brought the news that the French fleet under Pierre-Charles Villeneuve had escaped from Toulon. While Nelson made for Sicily to see if the French were heading for Egypt, Villeneuve was entering Cádiz to link up with the Spanish fleet. On May 7, Nelson reached Gibraltar and received his first definite news. 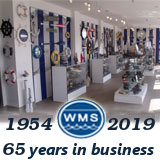 The British fleet completed their stores in Lagos Bay, Portugal, on May 10 and two days later sailed westward with ten ships and three frigates in pursuit of the combined Franco-Spanish fleet of 17 ships. They arrived in the West Indies to find that the enemy was sailing back to Europe where Napoleon Bonaparte was waiting for them with his invasion forces at Boulogne. The Franco-Spanish fleet was involved in the indecisive Battle of Cape Finisterre in fog off Ferrol with Admiral Sir Robert Calder's squadron on July 22 before taking refuge in Vigo and Ferrol to land wounded and abandon three damaged ships. Calder on August 14 and Nelson on August 15 joined Admiral Cornwallis's Channel Fleet off Ushant. Nelson continued to England in Victory leaving his Mediterranean fleet with Cornwallis who detached twenty of his thirty-three ships of the line and sent them under Calder to find the combined fleet at Ferrol. On August 19 came the worrying news that the enemy had sailed from there, followed by relief when they arrived in Cádiz two days later. On the evening of Saturday, September 28, Lord Nelson joined Lord Collingwood's fleet off Cádiz, quietly, so that his presence would not be known. Victory took Nelson's body to England where, after lying in state at Greenwich, he was buried in St. Paul's Cathedral on January 6, 1806. In 1889, Victory was fitted up as a Naval School of Telegraphy. It soon became a proper Signal School, and signal ratings from ships paying off were sent to Victory instead of the barracks, for a two-month training course. The School remained on Victory until 1904, when training was transferred temporarily to HMS Hercules, and in 1906 the whole School was moved to a permanent establishment at the Royal Naval Barracks. As the years passed by, Victory slowly deteriorated at her moorings. A campaign to save her was started in 1921 with the Save the Victory Fund under the aegis of the Society for Nautical Research, by which time she was in very poor condition. The outcome of the campaign was that the British Government agreed to restore and preserve her to commemorate Nelson, the Battle of Trafalgar and the Royal Navy's supremacy during and after the Napoleonic period. On January 12,1922 she was moved into the oldest drydock in the world: No. 2 dock at Portsmouth for restoration. In 1928 King George V was able to unveil a tablet celebrating the completion of the work, although restoration and maintenance still continued under the supervision of the Society for Nautical Research. 'Victory' was bombed in 1941 by the Luftwaffe causing damage to the hull. Over the last few years the ship has undergone another very extensive restoration to bring her appearance to as close as possible to that which she had at Trafalgar for the bicentenary of the battle in October 2005. HMS Victory is still in commission as the flagship of the admiral for the time being acting as Second Sea Lord in his role as Commander in Chief of the Royal Navy's Home Command (CINCNAVHOME). She is the oldest commissioned warship in the world, although the USS Constitution, launched 30 years later, is the oldest commissioned warship still afloat. Victory attracts around 350,000 visitors per year in her role as a museum ship. The Victory's foretopsail was severely damaged during the battle of Trafalgar, perforated by upwards of 90 cannonballs and other projectiles. It was replaced after the battle but was preserved, and eventually came to be displayed in the Royal Naval Museum. The sail is laid out across a large chamber, illuminated by alternating lowlight projectors. The name is also used to refer to the westernmost entrance (Victory Gate) to the Royal Navy's facility in Portsmouth, HMS Nelson. The most senior Trafalgar descendant alive and HON Commanding officer is James Hardy.